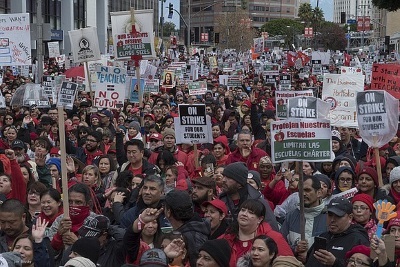 MultiBrief: Did the Los Angeles teachers’ strike change US education? Did the Los Angeles teachers’ strike change US education? The Los Angeles teachers’ strike — settled in January — was 1) an expensive waste of time or 2) changed the course of education in America. Take your pick. Your choice may depend more on your political views in general than the underlying facts. Here are the two opposing views and an attempt to determine an underlying reality that both sides might grudgingly agree on. In a blisteringly critical article in the politically conservative National Review, two journalists conclude, that "the settlement agreement is nearly identical to LA Unified’s pre-strike offer," that the teachers were probably overpaid to begin with, and that their demands, almost all of them unachieved according to the authors, would have quickly driven an already financially stressed school district into insolvency. Another point made by the authors — and it’s one frequently brought up when teachers’ unions are criticized — is that the intractability of teachers’ unions has brought upon them what they feared most: charter schools. According to this argument, teachers’ unions’ primary focus on benefits for teachers rather than students motivates parents and some educators to create more flexible student-focused charter school systems. If this is true, whatever additional rules and regulations the union succeeded in incorporating into the strike’s 31-page settlement agreement will simply motivate the establishment of more charter schools and a shift in the U.S. from public to private education. On the contrary, according to Eric Blanc, writing in the politically liberal The Nation, the L.A. teachers’ union "took on the billionaires," and achieved an historic win for LA’s public schools that includes smaller class sizes, increased support staff and a number of social-justice demands, such as immigrant student rights and new prohibitions against racial profiling having to do with student assignments to specific classes. Blanc goes on to argue that "it would be hard to overstate of the importance of this victory" against school privatization (charter schools, principally) because it teaches "working people across the country how to fight back and win." The National Review authors’ claim that the teachers settled for salary increases nearly identical to what had been offered and rejected before the strike began is largely true. The 6 percent raise in the agreement is nearly identical to what had been offered. The support staff and working condition demands, however, were farther-reaching to begin with and were largely met. Class sizes, for example, in the lower grades have been capped at 24 to 27 students (depending on grade level). Some classes have had as many as 47 students. The L.A. Unified School District will no longer have the power to raise class sizes without teachers’ consent. There will be many more school nurses (300!) and 77 additional counselors. It’s pretty clear the National Review authors are stuck with an inherent contradiction when they claim the teachers’ strike accomplished very little but that the strike’s cost outcome will drive more students out of public education and into charter schools. In reality, what the teachers won is projected to cost $403 million over the next three school years — hardly "very little." It’s also hard to see why improving class sizes and adding support staff will drive students out of public education. More likely, it will encourage parents to stick with the LA public school system. So far as the conservative argument goes that teachers’ unions drive the movement toward charter schools, that may or may not be true; however, the union response is increasingly, and to a degree successfully, to organize and unionize teachers in charter schools as well. Despite these substantial gains, which inevitably will encourage other public school teachers to strike for similar objectives, there are plenty of pitfalls that could make the teacher’s win a pyrrhic victory. For one thing, and largely underestimated in optimistic accounts of the teachers’ win, two different state bureaucracies have the right to overrule the settlement if they find it "unaffordable." How they may rule isn’t presently known. The settlement itself calls for the school district to make it work by seeking “additional funds” from “state agencies.” But that’s been the problem all along. Parents’ largely side with the teachers demands, but California voters have been unwilling to pay for them. Nothing in the settlement agreement addresses this issue, which largely depends upon California’s voters, not cash-strapped school districts. California’s politics are increasingly Democratic-dominated and Democratic voters increasingly lean leftward in reaction to the Trump administration, so it’s possible that Californians will revisit the underlying taxation issues that have created this crisis in California schools. But California’s taxes are already considerably higher than the national average. Whether Californians will solve the school-funding crisis definitively — by undoing or at least modifying Prop 13 — remains unknown. Prop 13 provides tax relief for home-owners, only some of whom have children in public schools.